Buy Wicked Suit Productions a Coffee. ko-fi.com/wickedsuitproductions - Ko-fi ❤️ Where creators get paid by fans, with a 'Buy Me a Coffee' button. Hi ^^ We make animation, comics, and sweet space music!  We just launched our first original project, Frontier-0 on YouTube, and the first chapter of it's companion comic is up on our site and Tapas (More coming soon!) However, in order to keep making more and expand, we need your help, anything you can donate goes a long way! Every donations helps us pay for our wonderful artists, editors, animators, actors, etc! We strive for the best content we can, and no one's work is free! Secured Payments. Support goes to Wicked Suit Productions's account. 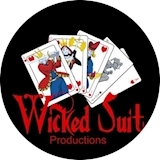 Upgrade Wicked Suit Productions to a yearly Gold Membership with a one-time payment.